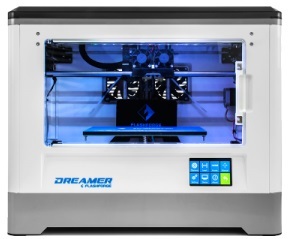 The Flashforge Dreamer FDM is a 3D printer with an enclosed chamber. With a low price and an easy set-up, this is ideal for those new to 3D printing, and the ability to use two colours and a variety of materials allows plenty of room for experimentation for the more experienced user. The results are reliably good and there are only a few minor drawbacks, including the noise level and the limit on filament spool size. However, this is a small-scale printer and is not suitable for larger designs. The Flashforge Dreamer FDM 3D printer has the dimensions of 485 x 400 x 335mm and a microwave like appearance. The build volume is 230 x 150 x 140mm. Inside the heated platform can reach temperatures of 120°C. The nozzle diameter is 0.4mm and printing speeds are up to 200mm/s. It takes filament with a 1.75mm diameter in a variety of materials and the spools are stored inside the chamber. An LCD screen on the front of the printer is used to monitor and manage the operations. Connectivity is achieved via an SD card, USB or WIFI. With its ‘plug and play’ set up, the Flashforge Dreamer FDM is easy to use even by those with no prior experience of 3D printing. The reliable design delivers consistently good results. A heated bed allows for a greater variety in the filaments used while the dual extruder allows different colours and materials to be used together. The noise levels on the Flashforge Dreamer FDM 3D printer are high, which may result in workplace disruption. The nozzle height needs frequent adjustment due to temperature changes in the box. Filament is stored inside the chamber which limits the size of the spool used. The build volume is on the small side.